For the most part, our tot school classroom is unchanged. Why ruin a good thing, right? There were a couple of additions that I wanted to add as everyday classroom staples now that Ethan is older. 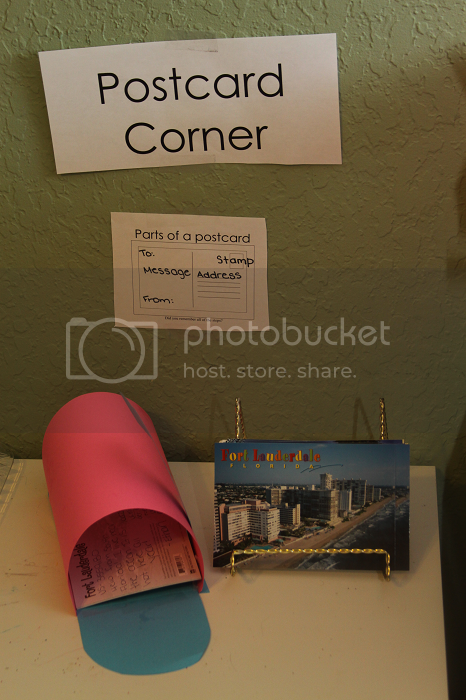 One of those things was an official postcard station. We have a beautiful set of classroom maps on the walls and now Ethan is really interested in learning his way around the world. I signed us up for Postcrossing and we have been marking where we send a postcard to as well as where we receive postcards from. This has given us a wonderful opportunity to learn about different places around the world! I constructed a quick mailbox out of some paper. Ethan and I write out, address and stamp his outgoing postcards and place them in the paper mailbox. When we leave our house, we bring them with us to place in our regular mailbox outside. When Ethan gets postcards, he's always happily surprised to find them waiting inside his classroom mailbox for him. I love exposing Ethan to actual handwritten letters and familiarizing him with, you know, mail that isn't received on a computer, so our postcard station has been such a welcomed part of our classroom. I can't wait to see our maps at the end of the year and marvel over all of the places our postcards have gone to and been received from!